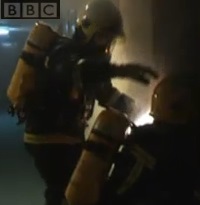 The dramatic story of how Warwickshire firefighters rescued ten people, who were trapped in flats above a Bilton shop has been featured featured on the hit series, BBC Real Rescues. Warwickshire’s Assistant Chief Fire Officer, Jim Onions said: “This episode showcases the bravery and expertise of our crews and control operator, Michelle Rulli, who’s composed and professional handling of the call helped to calm the lady down after giving the wrong address to the incident. Residents living above the 'All in One' store on Freemantle Road, Rugby had to be rescued from their homes by firefighters using ladders and ropes after the explosion on the morning of the 5 July 2012.